The words to a song (not spiritual) were overheard which triggered this Series into existence, realizing through it that we as Christians do have someone to “lean on” in every season of our lives. He who created us, is involved in our every day lives – whether we want or realize it or not – try breathing without His provision of air… It is all about who He is and Who’s we are, for our Bible tells us so. Naming such a Series can be more difficult than at first pondered – that was the difficult part. There are two parts or sets in this Series, the first being the Promises that are made to us by the Lord and then a second being what we can do because of Him being the Lord. The color change from black to red, signifies the Blood of Jesus giving us those abilities to do each item. While it is realized that four of the eight of the second set are from the Old Testament, remember we can say and live those things because of our Salvation, paid for by the Lord Jesus Christ. The research perspective on this Series started with two simple, but powerful words: “call” and “can”, for they actually do go hand-in-hand. Not trying to be a “poet and didn’t know it” one bit, just noticed that in the beginning verse of Jeremiah 33:3 | KJV that the perspective was given in a very short, concise manner for us to grab onto in our daily lives. 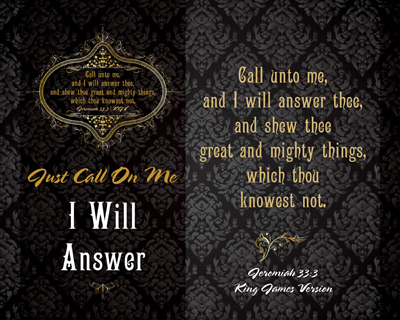 We have to remember that He is waiting for us to call “unto” Him, as He has desire to “answer thee” and will show us “great and mighty things” that we haven’t even begun to think about. 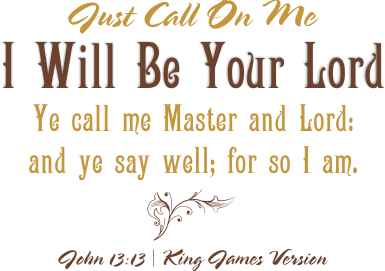 I’ve found that in needing to hear those Promises, that they become more real to me as matches are found for them of things that He allows me to do because of the Promises. It was tough to decide even which print would be used to represent the Series because of those Promises being answered in SO many different ways! He is Faithful to show us things we “knowest not” if we will just “abideth” in Him which allows us to do everything He has set before us to do! The Perspectives list is incredible – as all the verses of the Word of God are – and have an amazing response in Scripture for us to model and “do”. It is my hope that these eighteen (18) reminders will become as important to you as they have become to me!